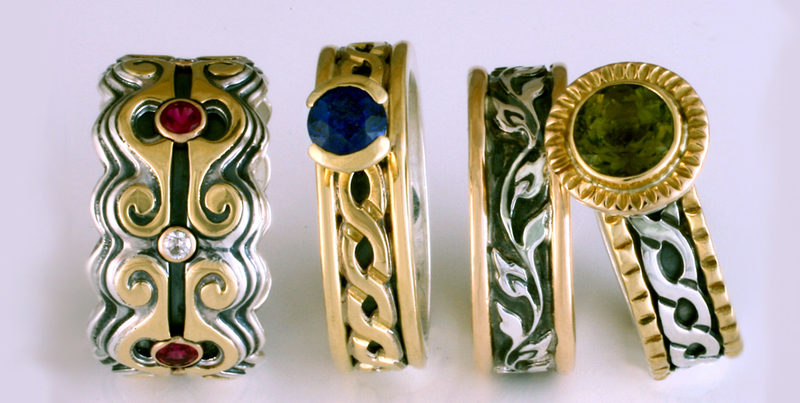 Our designer rings shown with the various mounts we offer, from flush, to split and custom. The terms "setting" and "mount" refer to how a gemstone is actually placed into a ring, which is both a practical necessity and an important stylistic choice. This brief article will help you understand the possibilities when deciding on an engagement ring setting from our collection. For round stones, we recommend split mounts. They are open on the sides, allowing plenty of light, illuminating the gem. They show the gems brilliantly, as illustrated in the Extra Narrow Water lilies ring. Split mounts are a top choice in order to feature, or draw out the gemstone in your engagement ring. It is possible to set the split mount low against the ring, so the gem is not as prominent, as shown, with a sapphire, in our Windsor ring. It's imperative for us to know at the time of ordering that you would like the gem set low. Another benefit of split mounts are that they are stronger than prong mounts. In additian, we personally feel they look more elegant as well. The most traditional setting in an engagement ring is the prong mount. Prongs are designed to hold any gem shape. The big advantage with prong mounts is the gemstone is featured prominently and the light is even more maximized than a split, the gem is more exposed to light. When choosing a prong mount for your engagement ring, the main disadvantage is that prongs do not hold up as well as other mounts. Regardeless we use very high quality and strong prong mounts, as shown in our Flores engagement ring. A side note: the metal of the prong that holds the gem in place should be checked every few years. Bezel settings refer to a style of mount where metal surrounds the gemstone completely. Bezel settings in engagement rings are strong because the gem is contained almost entirely within the metal. We can mount just about any gemstone using a bezel setting if you so desire for your engagement ring. Tube settings, as shown with our simplicity engagement ring, are a specialized type of bezel setting. Tube mounts come either straight or in a slight "V" shape. Let us know your choice between the two variations, or we can offer a recommendation. These mounts also allow you the option of setting the gem actually lower into the ring. Another interesting option is the Rope Engagement ring, shown on the right. We can actually use this mount with any of our styles. We can also just set the gem into the band itself, as opposed to setting it on top of the ring. How low a gem can be set is determined by the actual size of the gem. Low settings are generally preferred by two groups of people: those with active lifestyle and those who prefer understatement. A gemstone that is set low into a ring is also less likely to get knocked about on an object or caught on the threads of a sweater. Some people are concerned that setting a diamond into a ring as opposed to a prong mount or split mount will reduce the sparkle. Regardless, diamonds and other gemstones look amazing whether they are featured in a prong, split mount or bezel setting. Sometimes people do not choose an engagement ring mount but settle for a single or multiple smaller gems. We can set any small gem of your choice directly into the metal, as in our Garden Gate engagement ring, or like with our Medieval ring we placed the rubies and sapphires in small gold tube bezels, which are set into the ring. Small bezels are necessary for rings when the gemstones are larger than 2.5mm; otherwise, the gem would stick out inside the ring and run along the finger. With our Medium Flores ring, we set the diamonds into the metal. This latter type of setting is known as a gypsy or flush setting. We choose what we believe looks best. This stone setting is guaranteed for life. If a gem is lost due to defective workmanship, we will replace it for free. For gemstone choices, generally rubies, sapphires and diamonds are the most popular and they also hold up the best over time. However, we can set any gem of your choice into your ring. We also have a few other settings that are not as traditional for wedding or engagement rings, but have more of a designer feel. This designer engagement ring mount, like with our Keltie ring is one of our favorites. We can set this type of mount on just about any of our rings. Final considerations: the metal on the ring will match the metal that we use to make the mount. If it is a two tone ring, we will produce the ring as shown on our site, or contact you if we feel a need to discuss the design matter at hand. The mount metal choice often comes up with custom designs.